Striker Robbie Simpson has become the seventh signing of the summer as Paul Tisdale continues to snap up former Exeter City players. Joining Ryan Harley, who signed for Dons earlier today, Jordan Moore-Taylor and Tisdale's managerial backroom staff, 33-year-old Simpson arrives on a free transfer from St James Park. Making nearly 300 appearances in his career, Simpson has 50 goals to his name for eight clubs since 2004. 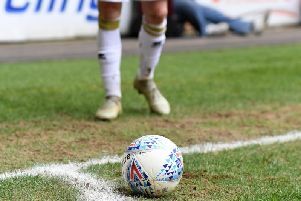 “I’m really pleased and excited to join,” Simpson told mkdons.com. “I know Tis and Matt Oakley very well so it was a no brainer for me to work with them again. "This is a great club that unfortunately hasn’t had the best of times in recent years. I’m really looking forward to playing a part in getting the Club back on the right tracks and where it belongs. “I feel I can definitely bring some experience to the side. Having met the squad, we have some really talented players and hopefully my experience can help to bring the best out of them. Manager Tisdale added: “Robbie brings experience and personality to a squad which is entering Sky Bet League Two for the first time in 10 years. He’s always been regarded as a team player and he will contribute both on and off the pitch.